Step (1) − Click on Pages → All Pages in WordPress as shown in the following screen. Step (2) − You can view About Us (About Us was created in the chapterWordPress – Add Pages). When the cursor hovers on the pages, then few options get displayed below About Us. There are two ways to edit the Post, i.e.,Edit and Quick Edit. 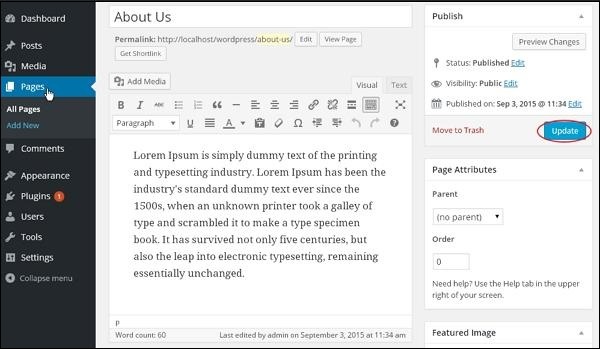 Edit − Click on Edit option in About Us as shown in the following screenshot. You can edit or change the content or title from the page as per your need, and then click on Update button as shown in the following screen. 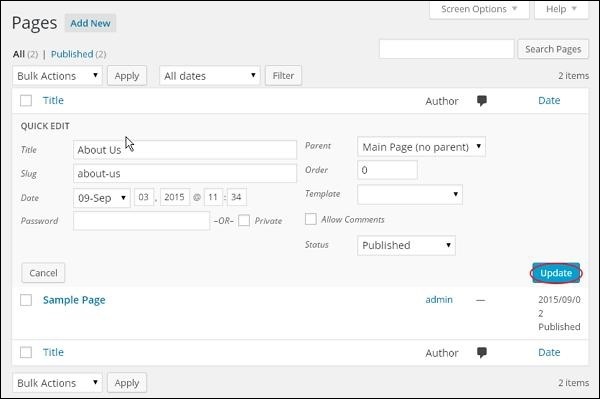 You can edit the Title, Slug and date of the About Us page and can also select the parent for your page as shown in the following shot and then click onUpdate button.